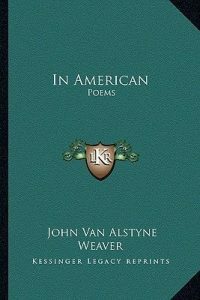 John Van Alstyne Weaver was an American screenwriter, novelist and poet at the beginning of the 21st century. 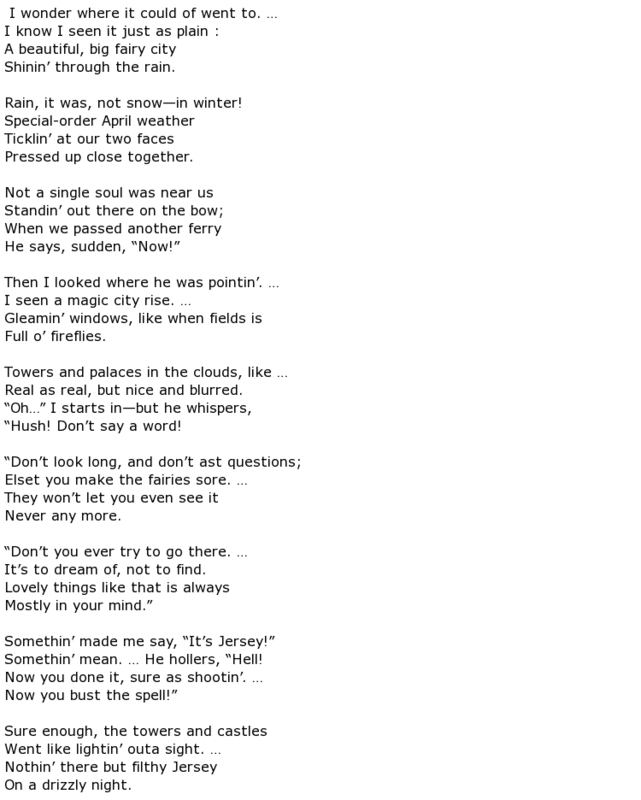 A poet of the Carl Sandburg and Ring Lardner school, Weaver wrote his poetry about the average person on the street, using the dialect and vernacular of the working man. H.L Mencken, whose interest he attracted, with his work, believed that he was the first poet to attempt to write in such a manner, making full use of iambic pentameter rhythms as well as the vernacular in his first book of poetry In American. The book which was published in 1921, made him a prominent figure in the literary world almost instantly. Born into a wealthy family on July 17th, 1893 in Charlotte, North Carolina, Weaver was of Scottish, Irish, Huguenot, German, English and Dutch ancestry, with family connections to a number of the prominent North Carolina families. His family moved to Chicago shortly before his first birthday and were prominent in both literary and social circles there. He graduated from Hamilton College in 1914, and returned to Chicago where he worked for the Chicago Daily News preparing advertising copy and assisting the book editor. He took a short break from his literary career during the period 1917 to 1919 when he served two years in the army, being promoted from sergeant to lieutenant during this time. On his return, he began working at the Brooklyn Daily Eagle, but in 1924 he ceased working for newspapers so that he could concentrate fully on his literary career. It was during this time that he met and married American stage and film actress Peggy Wood, they had a very happy marriage, which produced one son, David. Weaver is perhaps best known for his first poetry collection In American, published in 1921, the collection has been through staggering 13 printings. Such was the popularity that it led to Weaver writing a further five poetry books that continued along a similar them and use of language: Finders (1923), More in American (1926), To Youth (1928), Turning Point (1930) and in 1932 he wrote the autobiographical Trial Balance: A Sentimental Journey. In 1928 Weaver began work at Paramount studios, during his career he collaborated with George Abbott, a successful playwright and wrote original script for Clara Bow as well as an adaptation of Tom Sawyer. He spent long periods of time in Hollywood writing dialogue for motion pictures. He wrote three successful novels during his time in Hollywood as well as appearing on the lecture circuit and contributing poems and short stories to a number of magazines. Weaver died in Colorado Spring, Colorado on 15th June 1938 at the age of just 44. He had Tuberculosis. Following his death In American: The Collection Poems was published with foreword provided by H.L. Mencken.